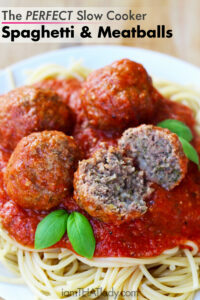 You will never make Spaghetti and Meatballs any other way again! Just set it forget it in the slow cooker! Combine crushed tomatoes, 2 minced cloves of garlic, 1 Tbsp of basil and 1/4 tsp of black pepper in the slow cooker. Stir. Using your hands, mix the meat with the ingredients. Form into golf-ball sized balls. Add the meatballs to the slow cooker and gently submerge in the sauce.